The beauty of the Flint Hills and a variety of structures constructed from its native limestone are among the attractions of the Native Stone Scenic Byway. 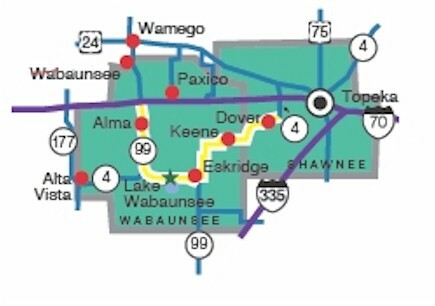 This byway traverses parts of western Shawnee County and Wabaunsee County along K-4 and K-99. The 48-mile route passes through Alma, Eskridge, Keene and Dover, offering visitors a glimpse of rural Kansas life. The winding byway, which cuts through the rolling terrain of the eastern Flint Hills, also provides visitors a chance to view walls, bridges and buildings constructed of native limestone. "The Flint Hills region is one of the most beautiful and distinct natural attractions Kansas has," said Kansas Transportation Secretary Deb Miller. "The state designation will create greater awareness of this area for visitors and spur an interest in the communities along the route. It is another way we can promote tourism in an area abundant with natural and cultural importance." Governor Kathleen Sebelius praised the designation of the route as a state scenic byway. "This is such a beautiful area that deserves the scenic byway distinction," said Governor Sebelius. "I encourage Kansans who have not had the opportunity, to pull out your maps, take a drive and enjoy the scenery." Wildlife watching opportunities near this byway include Council Grove Lake, Green Memorial Wildlife Area, Pillsbury Crossing Wildlife Area, Oregon Trail Nature Park and the Konza Prairie. Download the brochure for the Native Stone Scenic Byway by clicking here.